Circle shaped top bookmark. 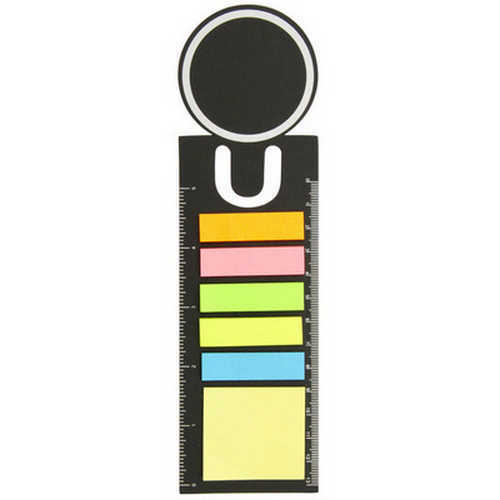 14 cm ruler. 1 x Sticky notes with 15 leaves. 5 x different colour adhesive note flags with 15 leaves per colour. Product Size: 215 x 60 mm. Product Packing: Bulk packed. Decoration Size: 40 mm diameter. Decoration Position: Round face of bookmark. Decoration Method: Pad Print. Carton Quantities: 600. Carton Size: 43.5 x 24 x 36.5. Carton Weight: 10. Colour: Black. Price includes : Pad Print 1 Colour / 1 Position. Setup is included.